This page will explain how to create different mailing lists from one target based on which method the targeted voters used to vote. This will allow you to segment those who voted early, by mail, and at the polls for your mailings. First, create your targeted voters group, we'll call them "Targeted Voters." Additionally, create two groups to track your VBM and Early Voters. From the main menu, go through Query/Targeting and enter your criteria for which voters you want to classify as VBM voters. 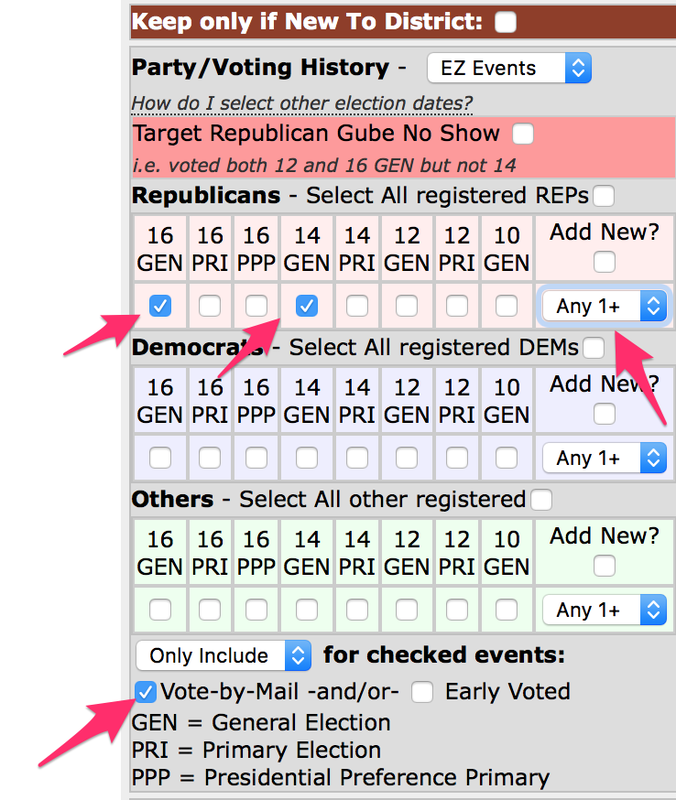 For this example, we will use anybody that voted in the 16 or 14 General via VBM by checking the 16 and 14 GEN, leaving the dropdown criteria of "Any 1+" and then checkmark the only include for checked events "Voted-by-Mail" checkbox. This will select anyone that voted by mail in either the 14 or 16 general elections. 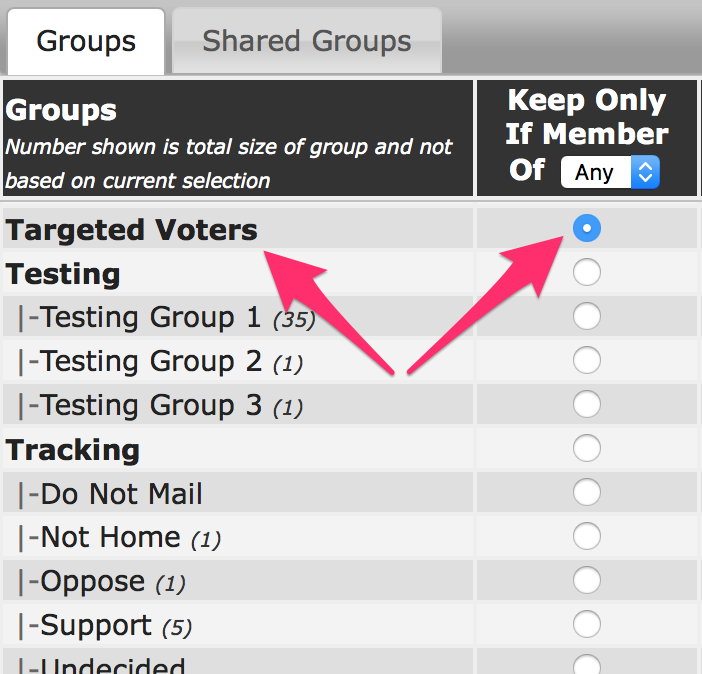 Now we want to narrow it down to only those voters on our targeted list, so on Group Criteria select the first column for the "Targeted Voters" group. 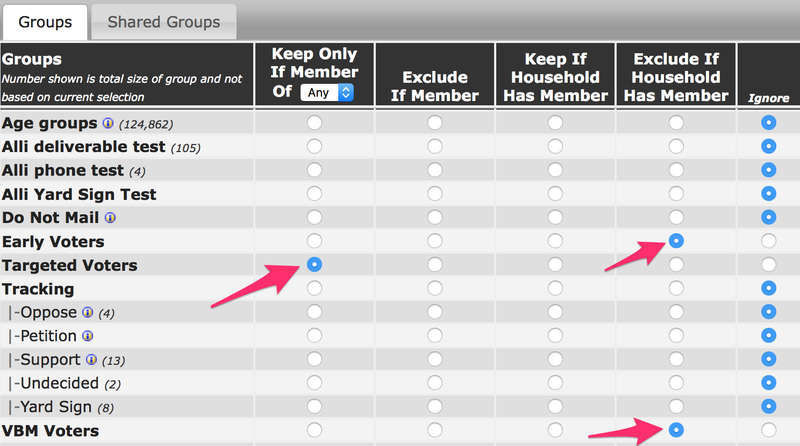 On the output page, select to Add to Group and choose your VBM group. That tags every targeted voter that also voted by mail in the 16 or 14 General election into this group. Repeat the query/targeting process again, but this time instead checkmark the Only Include for checked events "Voted Early" checkbox and save to the "Early group." Now we can create your exported addresses lists, so we will prioritize the VBM list. Go through query/targeting again and skip the first page to select every voter. 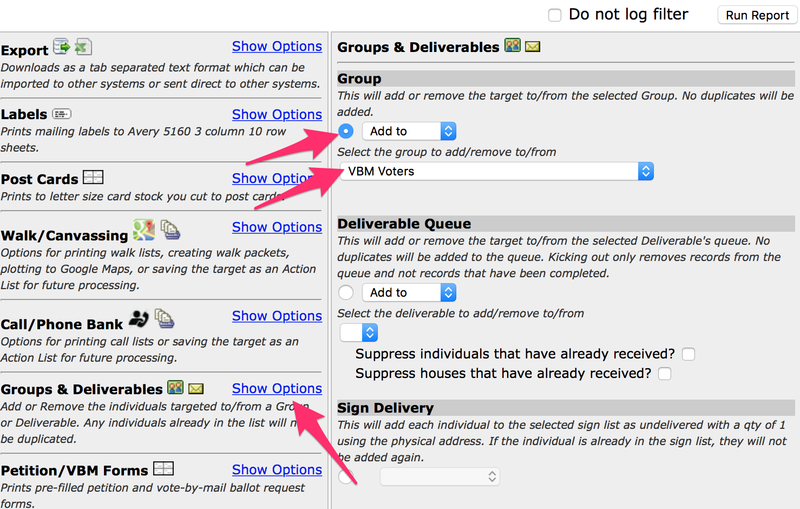 On the Group Criteria page, select the first column for your Targeted Voters group (keep if member), and the 3rd column for your VBM group (keep if household has member). 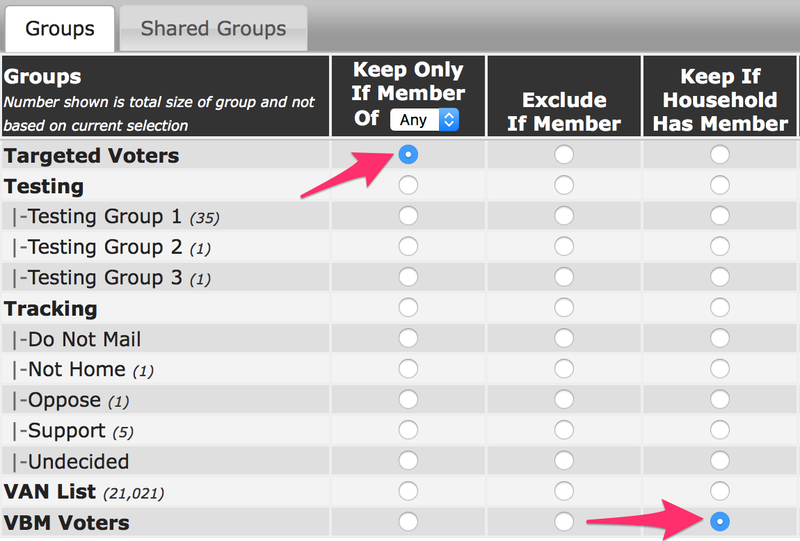 This will now select any voter in Targeted Voters that lives at the same hose as a voter in your VBM group. On the output page, select export --> household. Save this file as "Targeted VBM Addresses." Now we will do the Early Voted list by going through Query/Targeting again and skipping the first page to select every voter. On the Group Criteria, select the 1st column (Keep only if member of) for Targeted Voters, the 3rd Column (Keep only if household has member) for "Early Voters", and the 4th Column (exclude if household has member) for "VBM". This keeps all targeted voters that live at a house with a voter on the "Early" list BUT kicks the address out if it is in the "VBM" list so we don't duplicate the mailing to it. Export Household list and save as "Targeted Early Addresses." Now, to get the remaining targeted address that are only election day voters, go through query targeting again and on Group Criteria select the 1st column of Targeted Voters, and the 4th column for both the VBM and Early groups. You'll be left with only targeted addresses that have not yet been exported.